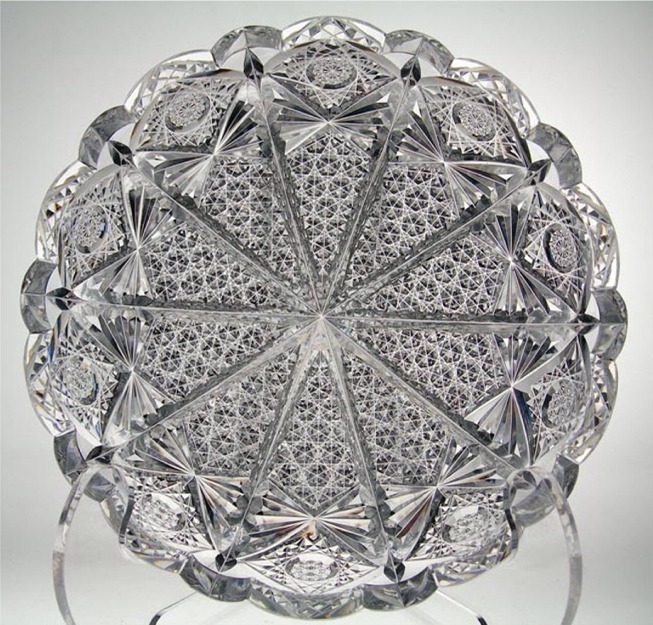 A number of years ago Martha Louise Swan, author of AMERICAN CUT GLASS OF THE BRILLIANT PERIOD, discussed a cut-glass motif that combines hexagonal hobnails, prismatic hexagons, and pyramidal triangles and gave it the name hexad (The Hobstar, Vol. 6, No. 2, p. 6). The word, taken from the Greek, means “a group or series of six,” and applies to the arrangement of the hobnails in the motif. Some writers consider the motif to be a variation of the cane motif and others, a variation of the Russian motif. Because hexad is formed by six intersecting sets of parallel miter cuts, it clearly cannot be a variation of cane which requires only four. The six intersecting sets of parallel miter cuts of the hexad motif make it a “close relative” of the Russian motif/pattern, which also uses six intersecting sets, but the hexad motif is distinctly different and should not be considered a variation of the Russian pattern. Nor should the motif be considered to be the same as the Russian pattern, of course, yet this is precisely what Pearson does in Vol. 1 of his ENCYCLOPEDIA (p. 191, lower left). The example there shows one of the several versions of the Wheat pattern that J. Hoare produced. It is incorrectly described as Russian and Swirl; Hexad and Swirl is what is clearly shown in the accompanying illustration. In this sketch the hexad motif has been drawn large. It is usually seen much smaller, as in Libbey’s Kensington pattern, for example. The hexad motif imparts richness to patterns and is a sign of quality, as pointed out by Swan. In its smallest form, the motif has undecorated hobnails but when cut slightly larger, they may be decorated. J. Hoare & Company used mitered (framed) hobnails in several of its patterns. 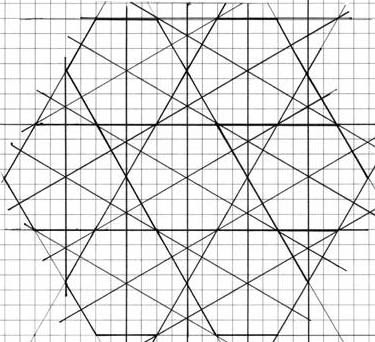 The large scale of the above sketch shows a design that some companies used for specific patterns. Libbey’s Stratford pattern and Hoare’s Champion pattern, to mention only two, both use the above outline. (These patterns appear to be identical — Stratford was patented in 1889; Champion was in production by 1896). 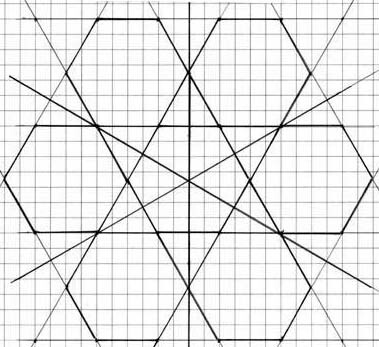 In each case full hobstars are cut on the large hexagons and strawberry (fine) diamonds cover the quadrilateral sections of the hobnails that are subdivided. 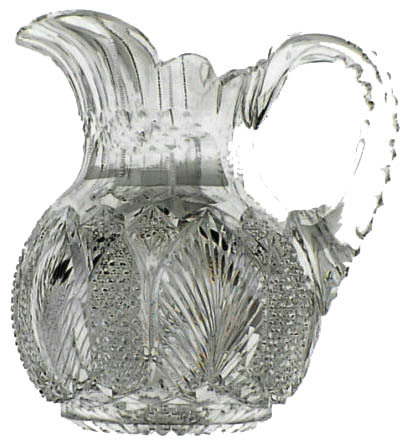 The hexad motif alternates with a fern-like miter motif on this pitcher. It was incorrectly advertised as a Kohinoor cutting on the Internet. The enlargement clearly shows that the motif in question is hexad. H = 8.5″ 21.6 cm), max D = 6″ (15.2 cm), wt = 4 lb (1.8 kg). Sold for $650 at auction in 2000 (Image: Internet). 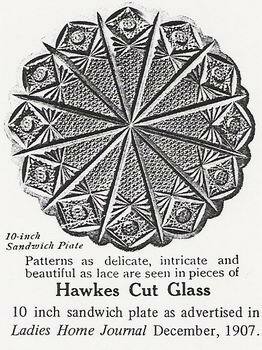 The following is an ad from T. G. Hawkes & Company that shows the Napoleon pattern on a plate (shape no. 350) (Ladies Home Journal, 1907). At one time the writer had this particular 10″D sandwich plate”, wt = 3 lb (1.4 kg), which he sold for $450 in 1982. He also once owned an example of the pattern on an oval dish with a smooth rim, L = 6.75″ (17 cm), W = 5.5″ (14.0 cm), H = 0.75″ (1.9 cm), wt = 0.75 lb (0.34 kg). It sold for $150 in 1983. Before its official name was discovered, the Napoleon pattern was known both as “Kohinoor and Hobstars” and “Lace,” and it can be found in publications under these names. The Napoleon name, as such, was first brought to the attention of dealers and collectors in an article that appeared in the May 1981 issue of The Hobstar. More recently the pattern was discussed in a second article that also appeared in The Hobstar (Vol. 27, No. 9, pp. 4501-2, May 2005). Unfortunately, this article contains several errors. A couple points should be made about the Napoleon pattern: Contrary to what has been written, probably all examples you will find have been chemically polished. Otherwise, it would have been impossible to give the Kohinoor motif the high polish that it always has. In 1904 T. G. Hawkes testified that “We use acid polish, completing the work by wooding and buffing . . . We have to go all over [acid dipped glass] three times and repolish it and buff it . . .” (Sinclaire and Spillman 1997, p. 20). The result of all this attention is that Hawkes cut glass from the late 1890s and early 1900s usually has an excellent chemical polish that is very similar to entirely mechanically polished glass — it is not at all “acidy” in appearance. The Napoleon pattern was probably introduced about 1902. In flatware, the Kohinoor motif in the Napoleon pattern comes in contact with underlying surfaces. Consequently, unless the plate/nappy containing it was always displayed vertically, or always rested on a soft surface, small chips in the motif are inevitable. Moreover, it is virtually impossible to “restore” this finely detailed cutting. Therefore, it is recommended that the motif be examined with a magnifying glass prior to purchase and any damage carefully considered. Can you live with it? If so, then consider buying it if the price is right. This is one pattern you are unlikely ever to get tired of! 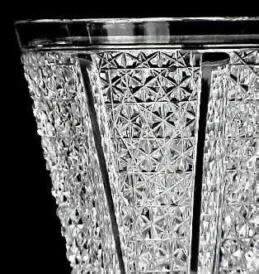 An example of the Kohinoor & Panel pattern on a goblet is given below. It was the company’s most expensive pattern after the Second World War (Sinclaire and Spillman 1997, p. 120). While Kohinoor & Panel, as well as Kohinoor & St. Louis, are seen on hollowware, the Napoleon pattern seems to be confined to flatware such as plates and nappies (Images: Internet). It is interesting to compare the hexad and Kohinoor motifs with the Russian and Prussian motifs: Kohinoor is to hexad as Prussian is to Russian.